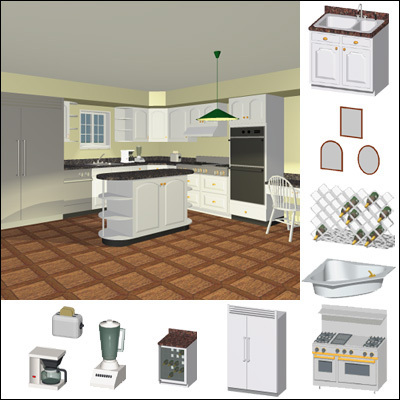 D3 Real Kitchen + Bath is the most realistic and flexible set of kitchen and bath objects available for ArchiCAD. Select from dozens of cabinets, appliances and fixtures commonly used in residential, commercial and institutional projects. Add details like custom door panels and handles, including appliances that have raised panels to match cabinets. Test a variety of layouts to maximize a kitchen or bath project's potential. Show off the finishing touches to capture the feeling of being there. Clients will have a better understanding of the design when you show them 3D kitchen and bath layouts that are just like being there. * NEW highly configurable cabinets with integrated sink and faucet, multiple doors and drawers, customizable panels, knobs and handles. * NEW integrated countertop with seamless sides and back, adjustable overhang, independent edge color and adjustable backsplash, sidesplash. * NEW upscale appliances with matching panels and several options. * NEW wine racks and undercounter wine cooler with random bottles. * Corner cabinets, built-in oven cabinets, and specialty cabinets and whatnot shelves. * Shower bases & enclosures and plumbing fixtures. * Medicine cabinets & mirrors. * Kitchen and bath accessories.